In Delft is gisteren een 36-jarige man uit Arnhem aangehouden, die bij de Nieuwe Kerk op de Markt op een vier meter hoog kruis stond. Het was een publiciteitsactie van de actiegroep Fathers4Justice. De brandweer moest de man met een ladder van het kruis halen. Wegens het niet voldoen aan een bevel, werd de man met een proces-verbaal naar huis gestuurd. De politie heeft op Eerste Paasdag een 36-jarige man uit Arnhem aangehouden, die bij de Nieuwe Kerk op de Markt in Delft op een vier meter groot kruis stond. 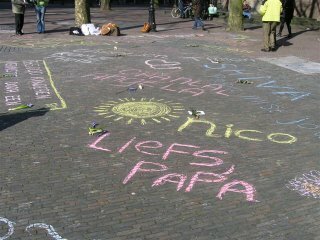 Het betrof een publiciteitsstunt van de actiegroep Fathers4Justice. De man werd gesommeerd van het kruis te komen, maar toen hij dat weigerde werd hij met een ladder van de brandweer van het kruis gehaald. Hij kreeg een proces-verbaal voor het niet voldoen aan een bevel. Delft – De politie heeft op Eerste Paasdag een 36-jarige man uit Arnhem aangehouden, die bij de Nieuwe Kerk op de Markt op een vier meter groot kruis stond. 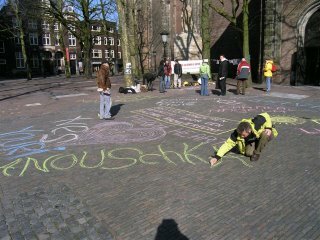 Het betrof een publiciteitsstunt van de actiegroep Fathers4Justice. De man werd met een ladder van de brandweer van het kruis gehaald. Hij kreeg een proces-verbaal voor het niet voldoen aan een bevel. Paasprotest op de Westminster Abbey in London door de Engelse "Real Fathers 4 Justice" die in januari 2006 in Engeland in de plaats traden van de alleen daar gestopte Fathers 4 Justice. Two fathers' rights campaigners who scaled Westminster Abbey in an Easter protest have been persuaded to climb down by Ann Widdecombe MP. Concerned that Good Friday services would have to be held outside, she urged the members of Real Fathers for Justice to end their 30-hour protest. Once on the ground, both men were arrested for aggravated trespass. Real Fathers for Justice is a splinter group of the high profile Fathers 4 Justice, which disbanded in January. Simon Anderton, 47, and Paul Addison, 39, from the North East, had carried a dummy on a mock crucifix with them, claiming it symbolised fathers being "crucified" by the courts over access to their children. Police officers had been trying to persuade the fathers to come down from the start , but Ms Widdecombe said it took her just 20 minutes. "I have gone up to them and said I am one of your greatest supporters," she told BBC London News. "What you are actually going to do is force a lot of elderly people to stand out on the green because we can't get into the abbey while you are there, so could you please consider coming down. "We had a bit of a discussion and I shall be reiterating my views on the plight of fathers"
"We had a bit of a discussion and I shall be reiterating my views on the plight of fathers. "I don't condone the method they are using but I am very glad I persuaded them to come down because I too am offended by their cross." The men spent the night 40ft up on a balcony without sleeping bags or supplies after the police took them. They had planned to dress as Romans for a crucifixion stunt on Good Friday but police also seized their costumes, their spokesman said. The original Fathers 4 Justice group disbanded after three years of audacious stunts to highlight the cause of men denied access to their children. LIFE STYLE EXTRA (UK) - Two Real Fathers for Justice campaigners who scaled Westminster Abbey ended their 30 hour protest early after Ann Widdecombe convinced them to come down and allow Easter worshippers to enter the historic building. 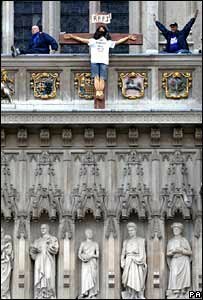 The two men, aged 30 and 48, had climbed the walls of the Abbey in the shadow of the Houses of Parliament and attached a dummy on a cross to a balcony 40 ft up. The protest by the splinter group which was formed after Fathers 4 Justice was disbanded in January threatened to disrupt Easter services as worshippers were barred from entering the church by police on safety grounds. But the MP for Maidstone and The Weald managed to convince the pair that their protest and the crucifix would be found offensive by worshippers. Describing her encounter with the two, Anne Widdecombe said: "Well they were due to come down this afternoon anyway. I said I was a great supporter of your cause and have always been so. "But I said you are not doing it any good by wrecking people's Good Friday service because as long as you were up here we are not allowed to go into the Abbey. "They then went into a great mobile phone conversation with their supporters on the ground and then said they would come down if I would agree to go on their march. "I basically said I did not know what my diary was like but I would make some public statement within the next two weeks. "I don't condone the method they are using but I am very glad I persuaded them to come down because I too am offended by their cross. "They were perfectly amicable and I think they were privately relieved to come down early as it was raining pretty hard." The men claimed the cross symbolised fathers who are crucified by the courts by denying them access to their children. Once on the ground the men were arrested shortly before 1pm and they were taken to a central London police station for questioning. Two fathers' rights campaigners who scaled Westminster Abbey have been arrested by police. The men were arrested at the historic London landmark's West Tower, after spending the night on a balcony, a Scotland Yard spokeswoman said. 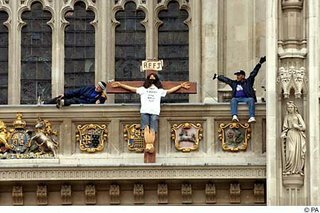 The pair climbed the building on Thursday morning with a dummy on a cross to signify that fathers were being "crucified" by current family law. The spokeswoman said they were being taken to a central London police station. Scotland Yard said the pair, members of the Real Fathers For Justice group, had been arrested for "aggravated trespass". "We did not force them down," she added. "They came down of their own accord." The protesters had claimed they targeted the Abbey in a bid to alert the church to the plight of fathers. 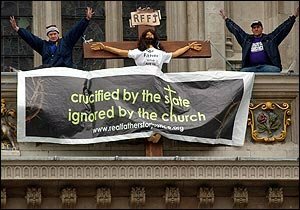 They gained access to the balcony, thought to be up to 60ft high, by pretending to be workmen and unveiled a banner with the slogan: "Crucified by the state, ignored by the church". Mike Kelly, spokesman for Real Fathers for Justice, said the protesters were Simon Anderton, 47, and Paul Addison, 39. Anderton is apparently suffering from liver cancer, and has not seen his two young daughters for five years. Addison has a 15-year-old daughter he has not seen for four years. Mr Kelly said Tory MP Ann Widdecombe, who has often spoken publicly about her Catholic faith, had climbed on to the balcony and met the men. "She gave a lot of support for the idea that fathers are denied access to their children, and has promised to make a statement about it over the next two weeks. She wanted them them to come down before the Easter parade came past," Kelly said. The pair left the balcony of their own choice after staging a mock crucifixion at around midday, according to Mr Kelly. They were arrested immediately. The original Fathers 4 Justice campaign disbanded after reports linked it to an alleged plan to kidnap Prime Minister Tony Blair's son Leo. MEMBERS of the Real Fathers' for Justice campaign today scaled Westminster Abbey. A spokesman for the father's rights group said two of its members had climbed 60ft up the country's most famous church. They were carrying a dummy on a cross to signify that fathers were being "crucified" by the state with unfair treatment in the courts. The spokesman said: "They had Roman soldier costumes, but the police have snatched them." The Real Fathers for Justice spokesman said the pair were on the nave of the Abbey, which dates from the 14th Century. "We want the church to do something to address the issue of equality in parenting." He added: "There are a lot of police here." A spokesman for the Dean and Chapter of Westminster Abbey said: "We understand and want to defend the right of legitimate protest, but would be disappointed if such a protest interfered with worship for thousands of members of the public over the holy week. "On another occasion we would be happy to listen to views presented in a calm and rational way." The spokesman said the protesters were 35ft up on a balcony on the West Tower, rather than the nave which is located inside. He said they were not currently concerned about damage to the building. A Metropolitan Police spokeswoman said they were called at 9am after reports that a group of men were demonstrating in the Abbey grounds. They had identified themselves as fathers' rights campaigners, and two were still on the balcony of one of the buildings, she added. "We are attempting to bring this matter to a safe conclusion." Fathers' rights campaigners climbed Westminster Abbey to stage a protest today. A spokesman for Real Fathers for Justice said two of its members had climbed 50ft to 60ft up the historic landmark in central London. They were carrying a dummy on a cross to signify that fathers are being "crucified" by the state with unequal treatment in the courts, he added. The spokesman said: "They had Roman soldier costumes, but the police have snatched them." The Metropolitan Police said they were aware that an incident was taking place at the Abbey. The Real Fathers for Justice spokesman said the pair were on the nave of the Abbey, which dates from the 14th Century. "We want the church to do something to address the issue of equality in parenting." He added: "There are a lot of police here." 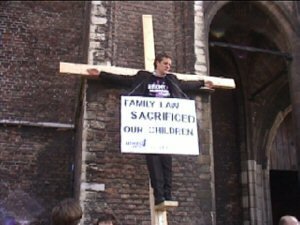 LONDON (Reuters) - Divorced fathers campaigning for equal access to their children tied a crucified dummy Jesus Christ to the front of London's Westminster Abbey on Thursday. Two protesters clambered up the abbey with the dummy figure that wore a T-shirt bearing the words: "Our Father Who Art in Hell." The "Real Fathers For Justice" said in a statement that they had staged their Easter protest to "demand that both parents be as equal in family law as they are in the eyes of God." In January, the mainstream Fathers4Justice campaign group decided to disband after reports that police had foiled a plot to kidnap Prime Minister Tony Blair's five-year-old son Leo. The group, which insisted that none of its current members had been involved in any kidnap plot, had staged several high-profile protests in the past few years. A campaigner dressed as Batman climbed Queen Elizabeth's Buckingham Palace in 2004 and another threw purple flour bombs at Blair while he addressed parliament. Two fathers' rights campaigners scaled Westminster Abbey on Thursday in a protest over divorced dads' access to their children, a protest group said. Real Fathers 4 Justice said the two men had climbed 50 to 60 feet (15 to 18 meters) up the medieval landmark. Tourists and passers-by stopped to take pictures of the men, who carried a dummy on a cross and a banner reading "Crucified by the state, ignored by the church." Mike Kelly, who identified himself as one of the protest organizers, said the men were appealing to the Church of England to intervene on behalf of fathers. "We want the church to come out with a statement. We want them to come out and say a child needs both parents, provided they are both decent people," he told reporters. Terrence Bates, 45, a member of the group, said fathers are being "increasingly crucified" by family law courts. Campaigners accuse the courts of unfairly denying men access to their children. "Why are they standing around doing nothing while this social chaos goes on?" Bates said. London's Metropolitan Police said officers were attempting to coax the men down. "The law needs to be changed to sympathize with fathers whose wives stop them from seeing their children," said Doug Collins, 37, a campaigner from Burton upon Trent, a town in central England, watching the scene. Phil Green, 29, of Guilford, a town in southern England, was among others who paused to observe the protesters. "The cause is right, but the way they're going about it is wrong," he said. "You need to go through the proper route." Real Fathers 4 Justice is a splinter group of a defunct organization that campaigned for changes to child custody laws. The original group staged a series of attention-grabbing stunts including hurling purple powder at Prime Minister Tony Blair in the House of Commons but said it was disbanding in January following allegations that extremist members were plotting to kidnap Blair's 5-year-old son Leo, reports AP. TWO men who yesterday scaled Westminster Abbey in a fathers’ rights protest are preparing to spend the night there. A spokesman for Real Fathers for Justice said the pair had climbed 50ft to 60ft up the landmark at 7am. They carried up a dummy on a cross to signify that fathers were being “crucified” with unequal treatment in the courts over access to children. Today at midday they plan to stage a Good Friday crucifixion stunt. But the spokesman said their supplies and sleeping bags - along with Roman costumes they had planned to wear - had been taken by police. The men, aged 30 and 48 and from the north-east of England, were determined to carry on, he said. The older man is suffering from a terminal illness. “He hasn’t seen his child in four years, despite having numerous contact orders which are just flouted time and time again,” the spokesman said. Police confirmed the men were still on the roof. They are unlikely to try to bring the men down by force. A Westminster Abbey spokesman said earlier: “We understand and want to defend the right of legitimate protest, but would be disappointed if such a protest interfered with worship for thousands of members of the public over the holy week. Fathers 4 Justice disbanded after reports linked it to an alleged plan to kidnap British Prime Minister Tony Blair’s son Leo. Over three years, members had carried out a variety of audacious stunts including hurling a package of purple flour at Mr Blair in the Commons, and dressing as Batman to stage a five-hour protest on a balcony at Buckingham Palace. Real Fathers for Justice, a splinter group, has vowed to keep carrying out high-profile demonstrations. FATHERS' rights campaigners today climbed Westminster Abbey to stage a protest. A spokesman for Real Fathers for Justice said two of its members had climbed 50ft to 60ft up the historic landmark in central London. They were carrying a dummy on a cross to signify that fathers are being "crucified" by the state with unequal treatment in the courts, he added. The spokesman said: "They had Roman soldier costumes, but the police have snatched them." The Metropolitan Police said that they were aware of an incident was taking place at the Abbey. The Real Fathers for Justice spokesman said the pair were on the nave of the Abbey, which dates from the 14th Century. "We want the church to do something to address the issue of equality in parenting." A spokesman for the Dean and Chapter of Westminster Abbey said: "We understand and want to defend the right of legitimate protest, but would be disappointed if such a protest interfered with worship for thousands of members of the public over the holy week." A Metropolitan Police spokeswoman said they were called at 9am after reports that a group of men were demonstrating in the Abbey grounds."